That is because increased government research funding from the US National Institutes of Health and Japan’s science and education ministry has driven expansion of doctoral and postdoctoral education — without giving enough thought to how the labour market will accommodate those who emerge. The system is driven by the supply of research funding, not the demand of the job market. Until any of this becomes commonplace, it is up to prospective graduate students to enter a science PhD with their eyes open to the opportunities — or lack of them — at the end. Not all mushrooms grow best in the dark. The system of PhD education in the United States and many other countries is broken and unsustainable, and needs to be reconceived. In many fields, it creates only a cruel fantasy of future employment that promotes the self-interest of faculty members at the expense of students. The reality is that there are very few jobs for people who might have spent up to 12 years on their degrees. In 1973, 55% of US doctorates in the biological sciences secured tenure-track positions within six years of completing their PhDs, and only 2% were in a postdoc or other untenured academic position. By 2006, only 15% were in tenured positions six years after graduating, with 18% untenured (see ‘What shall we do about all the PhDs?‘). 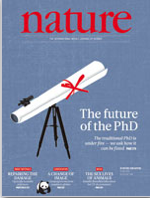 Figures suggest that more doctorates are taking jobs that do not require a PhD. “It’s a waste of resources,” says Stephan. “We’re spending a lot of money training these students and then they go out and get jobs that they’re not well matched for.”. If this all sounds familiar to you, it’s because the idea that we are producing too many PhDs in science is not new, and has been garnering recent attention. The Economist published The Disposable Academic last December. Beryl Benderly wrote The Real Science Gap and has many other articles on the topic. The situation is even more dire in the humanities. The problem is even creeping into law programs, where students take on crippling debt to finance their degrees, with no promise it’ll lead to a job. In science, the pyramid is upside down with too many students and postdocs and way too few places for them to work when they finish. This is simply because there is money to fund students and postdocs – money uncorrelated to the number of permanent positions that will exist 7 years down the road. Ideally, it would be more difficult to get into graduate school, but with better job opportunities after graduation. All the articles in the series are worth a read. Perhaps landing the cover of a science journal such as Nature is a turning point in getting the older guard to take this issue seriously. Meanwhile all of us need to tell it straight to undergrads aspiring to science: they need to enter graduate school with their eyes wide open. I generally agree with the point of views stated here. The system is also quite perverted as new tenure-track faculty are required to have successful students, feeding even more graduates to the grinding post-doc machine a few years down the road. If I ever manage to get a tenured position, the first thing I will do will be stopping to hire any grad student, others will train way more than enough for my postdoc needs. However I am not sure Universities (and professors) are ready to give up the nearly free (as in beer, not as in freedome) labour they get funding grad students. Perhaps if NSF/NASA put strong string in their grants regarding the use of grant money to pay grad students could it help solve the problem. I can only agree with what’s been already said. Concerning NSF/NASA funding system I would like to add something. Recently I had the ‘privilege’ of participating in some NSF panels. I read very good proposals and I hope that the best ones will get funded. What was common in all of them was that 90% of the funds were requested to cover PhD students and postdoc salaries+benefits (don’t forget the 60%-ish institutional overheads). Also, I find amazing that this was viewed as ‘normal’ by most of the other panelists and NSF officials. While I agree that educating the new generation of scientists is an important issue, my (probably) narrow view of the funding system is that the agencies should fund provide funds to make actual research. At the end, all the probably funded proposals were to pay somebody else but the PI in doing the actual work. In many cases, graduate students and postdocs were used as cheap highly trained manpower and i doubt many of them will get useful training after all. Call me radical, but I think this is a perversion of the system. Highly trained researchers in tenure track or faculty positions should be the ones doing the actual science. Given the already saturated pool of postdoctoral researchers bouncing from one temporary position to another, I really think the funding agencies should promptly rethink the whole funding system (eg. strongly limiting the institutional overheads and give more weight to the actual commitment of the PI to the actual work to be done) … just a thought. With the pace of change in society and labor markets so rapid these days, it appears likely that long-timescale factors like education (and personal choices about what careers to pursue!) are having a hard time keeping up. I worry this may only accelerate more in future years, given simultaneously the increasing displacement of human jobs by digital technologies (now including even intellectual jobs like lawyers and/or Jeopardy champions… see http://www.nytimes.com/2011/03/05/science/05legal.html for more on the computerization of law ) plus the likely disruptions as we move into a more resource-constrained, post-cheap-energy world. @”Ann” and Guille – Yes the way funding flows, it’s very easy to fund grad students and postdocs. Plus guiding a student to a PhD is part of how a professor is evaluated for tenure so naturally they’ll want to have graduate students. @Marshall – I also linked to an article about law schools overproducing lawyers; it’s a similar problem in that supply is not in any way linked to demand. It’s arguably worse for law school since the law programs directly make money from tuition from law students. They have a direct incentive to get more students. True, PhDs have low unemployment, but I would imagine that many are doing jobs they could have without spending less than 6-7 years in graduate school. That NSF stat comes from 2008 – I don’t know if it’s before or after the economic downturn or averaged over the responses from the whole year. 1. “Who are we to be the academic gate keepers by picking and choosing undergrads? How can we keep people out of science who want to be there?” — In my opinion, this argument falls apart when you see that there is still academic gate-keeping going on, just at the age of 30/40 instead of 20. 2. That “Science benefits from being able to cull the best minds from the top” — i.e. training all the good students, then choosing the best for permanent jobs, results in better scientists. While this may be true, it is a function optimizing for one thing: science. Humans, however, are the ones undergoing the training and getting or not getting the jobs. We need to optimize for science AND for humanity — i.e., the individual human is a valuable asset too! Of course, the other argument against birth control is that instead of cutting the supply of PhD’s, we should increase the demand i.e. jobs. While this is a very enticing option, I think the scope of our present argument on this blog post is about the supply-side of the economy. The other argument I’ve heard against birth control is that admissions committees can’t accurately predict who will become successful. It makes sense to me–if you handed me a pile of transcripts and GRE scores, I don’t think I could pick who would go on to science super-stardom. I think we’re going to see more postdoc positions start to go unfilled because the quality grads will leave the field directly after graduating. The social stigma against leaving just isn’t going to be able to hold up against the reality of the job market. That will get reforms pushed through–funding agencies are not going to tolerate PIs saying they can’t complete a project because they can’t hire enough talent to do it. That it an excellent point. What i find even more disheartening is “why so-and-so can’t get a job, while so-and-so did with the latter having a grand total of 3 papers and a dozen of citations after 6 years in postdoc? [real case]””. This reinforces the impression that the whole thing is basically just a lotto. yeah, when I see situations like that I figure hiring committees are just trying to gamble on picking who is going to have a more productive future. And if they guess wrong, they can just not give the person tenure! Hiring committee member has to be the easiest job right now, you can’t swing a dead cat without hitting a supremely qualified postdoc. But it is demoralizing to realize there is a steady stream of new phds where someone will always be doing “TEH HAWT NEW SCIENCEZ! !1!1”, so it doesn’t matter how many postdocs you do, if you don’t hit a hot topic you’re out of luck. One thing that bothers me in discussions of this topic is that academia and research are presented as the only (or at least the best) career path for those currently in graduate school. Teaching in particular gets the short end of the stick: if I were to decide to teach high school after getting my PhD, some folks would say that it’s a job I’m not “well matched for” and that the NSF funding my education was a “waste of resources.” Given the paucity of good teachers who are able to inspire their students, this is a rather silly notion. Instead of thinking about how there won’t be any academic jobs for future PhDs, we should be trying to reverse the prevailing view that academia is the only worthwhile career for PhD scientists. This is a tough problem and it doesn’t have a simple solution. Some causes are unique to academia, such as the very slow growth and the resource limitation which drives wages and job security down. But as Marshall suggests, other factors — globalization, digitization, speeding everything up x1000 and so on — will also take their toll, and no sector of the economy is really immune from those. As academics we can, and should, make institutional changes to limit human suffering. Increasing the number of permanent positions relative to temporary ones, a suggestion I saw recently in one of these articles, would be a good start, but both institutions and funding agencies will need to work together to make that happen. The success of such efforts will also ultimately depend on more science funding coming from cash-strapped institutions or the government, because doing research with permanent staff scientists instead of students and postdocs will be more expensive. Given the trajectory science funding has taken for decades you can imagine how that’ll go down, and it wouldn’t even have to be Paul Ryan’s budget proposal. At the end of the day, more senior scientists can only do so much, and each individual must be primarily responsible for their own life choices and what results from them. (That may include life choices the establishment doesn’t promote or sees as undesirable.) Probably the most important thing we can do is to give aspiring junior scientists as accurate a picture as we can of what they’re getting into before they start, and remind them that many other factors besides technical skills and tenacity — drive, self-reliance, self-awareness, courage to face one’s own weaknesses, communication/marketing, and blind luck — will be necessary, though perhaps not sufficient, to succeed in any of these high-powered career paths, academia not the least of them.